Photoshop Elements gives you several options for manipulating and working with multiple layers in an image. You can duplicate layers, drag and drop layers, and move a layer’s content. Duplicating layers can be helpful if you want to protect your original image while experimenting with a technique. If you don’t like the results, you can always delete the duplicate layer. Drag the layer to the Create a New Layer icon at the top of the panel. Elements creates a duplicate layer with Copy appended to the name of the layer. Choose Duplicate Layer from the Layers panel menu. If you use the menu methods, a dialog box appears, asking you to name your layer and specify other options. Provide a name for your layer and click OK. You can specify the other options later. The most efficient way to copy and paste layers between multiple images is to use the drag-and-drop method. Why? Because it bypasses your Clipboard, which is the temporary storage area on your computer for copied data. Storing data, especially large files, can bog down your system. By keeping your Clipboard clear of data, your system operates more efficiently. If you already copied data and it’s lounging on your Clipboard, choose Edit→Clear→Clipboard Contents to empty your Clipboard. Select your desired layer in the Layers panel. Grab the Move tool (the four-headed arrow) from the Tools panel. Drag and drop the layer onto your destination file. The dropped layer pops in as a new layer above the active layer in the image. You don’t need to have a selection border to copy the entire layer. But, if you want to copy just a portion of the layer, make your selection before you drag and drop with the Move tool. If you want the selected element to be centered on the destination file, press the Shift key while you drag and drop. If you have several elements (that aren’t touching each other) on one layer and you want to select only one of the elements to drag and drop, use the Lasso tool to make a selection around the object without touching any of the other elements. Then press the Ctrl (cmd on the Mac) key and press the up-arrow key. The element then becomes perfectly selected. Drag and drop with the Move tool. The Paste into Selection command lets you put an image on a separate layer while also inserting that image into a selection border. 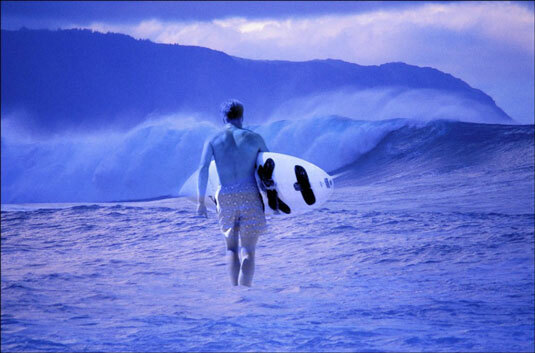 This technique was used in the following figure, to make it appear as though the surfer is in the water. Use the Paste into Selection command to make one element appear as though it’s coming out of another element. Make your desired selection on the layer in your destination image. Select the image that will fill that selection. Return to the destination image layer and choose Edit→Paste into Selection. Elements converts the selection border on the layer into a layer mask. The pasted selection is visible only inside the selection border. To move the content of a layer, grab the Move tool from the Tools panel, select your layer on the Layers panel, and drag the element on the canvas to your desired location. You can also move the layer in 1-pixel increments by using the keyboard arrow keys. Press Shift with the arrows to move in 10-pixel increments. The Auto-Select Layer option on the Options bar enables you to switch to a layer when you click any part of that layer’s content with the Move tool. But be careful if you have a lot of overlapping layers because this technique can sometimes be more trouble than it’s worth. Show Bounding Box: This option surrounds the contents of your layer with a dotted box that has handles, enabling you to easily transform your layer. Show Highlight on Rollover: Hover your mouse anywhere over the canvas to make an outline appear around the element on your layer. Click the highlighted layer to select it and then move it. Arrange menu: This menu enables you to change your selected layer’s position in the stacking order. Link Layers: This option, which resides not on the Options bar, but in the Layers panel, connects the layers to allow ease in moving (or transforming) multiple layers simultaneously. Select a layer and then Ctrl-click (cmd-click on the Mac) to select more layers. Click the Link Layers option. Align submenu: Align your selected layers on the left, center, right, top, middle, and bottom. As with linking, select your first layer and then Shift-click to select more layers. Ctrl-click (cmd-click on the Mac) to select non-consecutive layers. Choose an alignment option. Distribute submenu: Use this menu to evenly space your selected layers on the left, center, right, top, middle, and bottom. Like with aligning, select your first layer and then Shift-click to select more layers. Ctrl-click (cmd-click on the Mac) to select non-consecutive layers. Choose your desired distribution option.